Unified Communications enables your business to increase productivity, reduce operating costs, manage growth and improve business continuity. In today’s mobile world employees are looking to access their workspace from their phones and tablets, at home and on the move. Unified Communications means the integration of your voice and data network. It can be the simple integration of email with voicemail but can be extended to include unified messaging, mobility, conference and instant messaging.Tiecom provides Unified Communications solutions for organisations of all sizes. 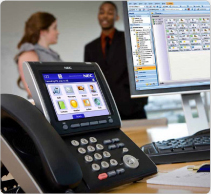 The NEC UNIVERGE SV9000 series communications servers are an ideal solution whether you are a small or large enterprise business.We offer a suite of collaboration tools designed for desktop, phone, and smartphone. All of these tools have been designed to improve productivity and reduce operating costs.